Doesn’t the city look majestic in the rain? I believe so! Rue Saint Honore is such a beautiful street with lots of fabulous shopping! All of life’s most luxurious brands have their boutiques there; such as Chloe, Chanel, Alexander McQueen, Fendi, the list goes on for miles. This is where I was walking around mostly, naturally. I also came across the prettiest flower shop that I believe sells only the most beautiful arrangements and bouquets of roses. 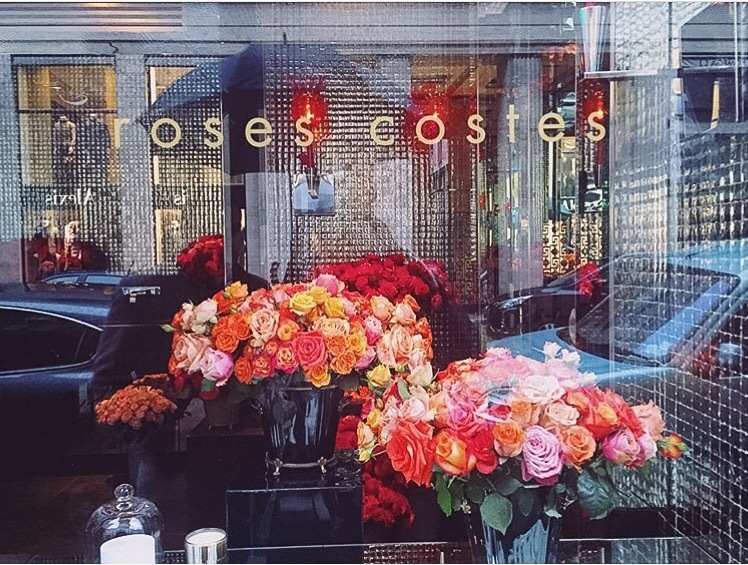 The shop is called Roses Costes which is located in Hotel Costes; A very chic boutique hotel! In the pouring rain, I couldn’t help but stop and fawn over how beautiful they all were in the various arrangements of colors and types of roses. I think I stood in-front of the boutique for a good 5 minutes. I wanted to walk inside and “smell the roses”, but like many shops in Paris on a Sunday, they were closed for business. I will definitely have to stop in next time I visit. Just look at the images below of how beautiful Paris looks. I was pleasantly surprised to see the Phantom of the Opera playing in Paris at the Magador Theatre. I really wanted to see it, but I believe the theater was closed for rehearsals. But, all I could think about was how the story of The Phantom of the Opera takes place at the opera house Palais Garnier (now known as Opera National De Paris) and how it should have been playing there now! I’m a sucker for sentimentality, what can I say! As we finished out hot coco, I text an old friend from college who I hadn’t seen in six years who now lives in Paris. Joey joined us for a few hours as we continued to relax and enjoy the atmosphere of Cafe de la Paix. It was so wonderful catching up with Joey after all this time as we insulted each other continuously out of love, just like old times! Learn more about Joey and her Fashion Illustration work here! It was great to know that despite the lack of communication and a change of address, nothing much has changed! We left the cafe around 7:30PM and from all the sugar I was so hungry! Eating sugar makes me very hungry! So, me and the beau decided to go for dinner. However, this was not as easy of a task as we thought. Like I said earlier, it was a Sunday in Paris and most places were closed for business. We spent almost three hours trying to find a restaurant or bistro that was open that did not cook with peanut oil. (I have a severe nut and peanut allergy) This was surprisingly impossible. I felt horrible and extremely embarrassed about it but I was made to feel very comfortable and better about the whole situation since it was completely out of my control! After searching and searching and searching… for a restaurant, can you guess where we ended up eating? McDonald’s!! I found this extremely comical! Out of all the places to eat in Paris, the night resulted in us getting a Big Mac from good old Mickey D’s! I thought this was even more interesting since for months all I heard was how McDonald’s in the states doesn’t hold a candle to how the McDonald’s in Paris tastes. Ordering there was from the future. You did not go up to the counter to order your meal, oh no no, you ordered on huge computer screens. Then you walked up to the counter to retrieve it! (Haha.) On the walk home I couldn’t wait to sink my teeth into what I has been told was a magical fast food experience. When we got back, and I took my first bite in otherworldly epicurean anticipation, all I could think to myself was how it tasted EXACTLY THE SAME AS IT DOES AT HOME!! I was laughing so hard!! I thought my world would have been changed from all of the previous talk about how it’s life changing! But, it was just a good old fashioned McDonald’s hamburger. However, it did the trick because if I didn’t eat something soon I was going to freak out! (haha) I don’t think I’ve ever been that hungry in my life! It became a joke for the rest of the week! It was the perfect first full day in Paris!